Five one-act plays performed in a random order might look like a novelty, but the interlinking in Roundelay makes this the best thing Alan Ayckbourn has done in nearly five years. Observant readers to this blog have noticed that, so far, I have never put an Ayckbourn play at the SJT into my What’s Worth Watching recommendations. Which might seem a bit odd to people who know that I’m a big Ayckbourn fan. There are two reasons for this, and the first is that every new Ayckbourn play gets loads of publicity and I prefer to concentrate my plugs on more obscure writers who need the attention. The second reason, however, is that it’s difficult to tell which new plays will be the must-sees. 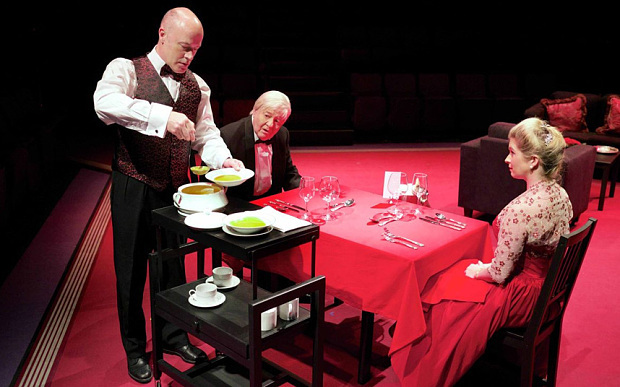 Alan Ayckbourn’s not had any totally new ideas for some time, but that’s okay because he keeps putting together old ideas in new ways and can still produce masterpieces, the last one being My Wonderful Day in 2009. Since then, however, we’ve have plays with ideas that didn’t quite work out, plays that did work out but had obvious derivations from old ones, and combinations of the two. Truth be told, I was sceptical about Roundelay. This was billed as five one-act plays, so already I wondered if we were headed for a re-hash of Confusions. The difference from its predecessor was that the plays are to be performed in a random order, with the plays interlinked in a way that works in any order. I wasn’t sure about that at all. We know from Ayckbourn’s Norman Conquests trilogy that he’s the master of interlinking – and yet, for all the cleverness of linking three plays with a concurrent timeline and the same casts, I was never convinced that made the plays much better for the audience. Would Roundelay be a piece that took great writing skill yet provided a mediocre play? Would the random order just be a novelty? One might think so if the lukewarm reviews in the broadsheets are anything to go by, so I’m going to stick my neck out and say this is the best new Ayckbourn play I’ve seen for nearly five years.